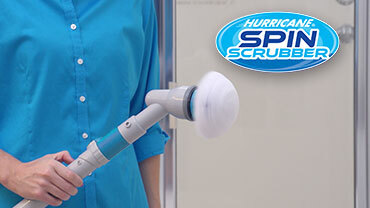 Hurricane Spin Scrubber™ | Official Site | The Easy Way To Scrub! No Bending, No Hard Work! The Easy Way To Scrub! No Bending, No Hard Work! Hurricane Spin Scrubber™ makes it so easy to clean. Let the powerfull scrubber do all the straining and reaching for you. You can use your Spin Scrubber to clean the shower walls and get all that nasty grime right off. Cleaning your tub and tiles is back-breaking work. You scrub your tile, but it always needs more. Hurricane Spin Scrubber™ is the new cordless and rechargeable scrub brush that makes cleaning faster and easier. READ FULL DESCRIPTION It blasts through grime for a sparkly clean every time. Even dirty old tiles aren't a match from Spin Scrubber! Now you can scrub away calcium deposits, soap scum, and hard water stains effortlessly. The secret is in the rotating brush that spins at 300 RPMs. Hurricane Spin Scrubber™ has incredible torque that can bust through any acked on mess. No batteries are needed. The cordless Hurricane Spin Scrubber™ utilizes the latest rechargeable technology. It comes with a free extension pole so you don't have to bend and strain. Plus the Hurricane Spin Scrubber™ comes with 3 brush heads - one dome, one flat, and one cone - to make sure you get all your hard to reach areas! You can get your Hurricane Spin Scrubber™ today, with 3 unique scrubber brushes, extension pole, AC adapter and mesh storage pouch for just $39.99 and get FREE shipping and handling. Plus, if you order now, you can double your order and receive a SECOND Hurricane Spin Scrubber™ plus accessories. All you pay is a separate $19.99 fee. Hurry because this offer won't last long! Hurricane Spin Scrubber™ Rotates At 300 RPM To Provide Incredible Torque! Flexible Brushes Mold Into Cracks And Crevices For A Complete Clean! Hurricane Spin Scrubber™ Extends To An Amazing 44 Inches So You Don't Have To Strain! Scrub Away Calcium, Grime And Even Hard Water Stains! Order Hurricane Spin Scrubber today for just $39.99 and FREE shipping and handling. You'll get the Hurricane Spin Scrubber, 3 scrubber brushes, extension pole,AC adapter and a mesh storage bag. Plus, you also have the opportunity to double your order. Just pay a separate $19.99 fee. That's not all - Each Hurricane Spin Scrubber comes with a 10 year guarantee. Order now! Select Your Hurricane Spin Scrubber™ Offer Above! Check out these other great products by Hurricane Spin Scrubber™. TEXT FOR OTHER PRODUCT OFFERS. Hear from other Hurricane Spin Scrubber™ customers how much they love it, and why you will too! Check out all the news for Hurricane Spin Scrubber™ and its creators at TeleBrands featured all over the world.